Probably! But make sure you've got the basics covered first. Always happy to see you. Can be won over with a treat (or even leftovers). Never makes a snide comment. Sound like the perfect co-worker? Close. Welcome to the world of the office dog. It may sound crazy to bring Fido to the office, but more and more workplaces are lifting the typical no-pets policy to allow dog owners to bring their fur babies to work. It’s a perk at many tech companies, like Amazon, Etsy and Google. Often, these policies begin when a boss can’t quite part with their dog for the entire work day. Some companies, like Build-A-Bear Workshop, even give the highest-ranking dogs fancy titles, like Milford the CED (that’s Chief Executive Dog to you). So, how do you know if your pup is ready to be a CED — or even just hang out at the office with you? What makes a good office dog? No matter how cute a dog is, it won’t be making friends in a shared workspace if it hasn’t yet learned do its business outside, and only outside. The dog should be able to follow simple commands, like any good puppy school graduate, and keep the barking to a minimum. A clean bill of health with up-to-date immunizations is a must. A dog-friendly office may be a temporary home for more than one pup at a time. A well-socialized dog that plays nicely will be welcomed by the others. Fear not, though. If your dog isn’t quite up to par today but has dreams of joining you at the office, in most cases a little extra training or a vet visit can get things in order. 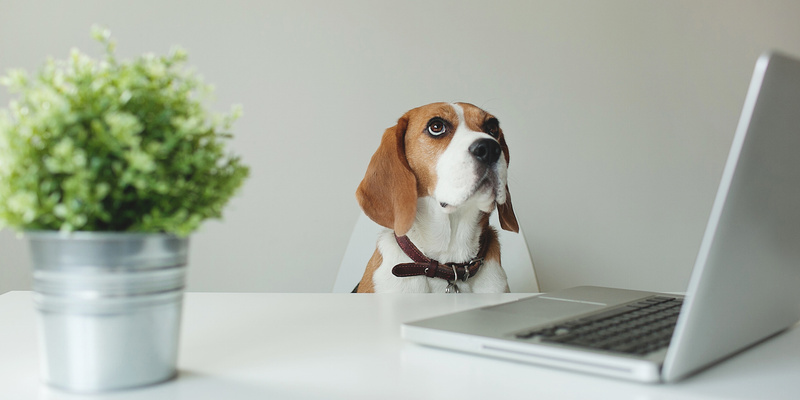 What makes a dog-friendly office? Even the best-behaved, cutest canine visitor won’t be able to make it without some support from the workplace and a prepared owner. There should be a comfortable spot for the dog to snooze or rest throughout the day while the owner is working, preferably near their workspace. A bowl of water should be on hand, but pet training guru Cesar Milan suggests not feeding dogs in your workspace. As for the office itself, the official rules should be clear. It’s important to know where dogs are and aren’t allowed — some workplaces will allow dogs in one gated-off area rather than roaming the entire company. Co-workers should be clear on how they’re allowed to interact with the dog (for example, are others allowed to pet the pup? Can they ask to take it along on a coffee break?). And what’s outside the office matters too — ideally there’s a spot nearby where you can take your dog out a few times during the day. Why bring your dog to work? It may seem like a lot of hassle just to bring a dog into work, but there are studies showing some pretty awesome benefits thanks to pups in an office. Okay, so the Center for Disease Control and Prevention doesn’t specifically talk about dogs at work. But, the authoritative body does say pets can help their human owners lower their blood pressure, cholesterol levels and feelings of loneliness. That’s not all. They’ll help up people’s opportunities to exercise and spend time in the great outdoors, as well as socialize with others. Those benefits don’t stop when you get to work — in fact, that may be where stress and the temptation to sit all day are highest. Not convinced yet? A 2012 study found dogs in the office can reduce stress and increase the workplace satisfaction of co-workers. How’s that for workplace morale? Despite this, it’s possible not everyone will be eager to welcome a furry co-worker. It may be hard to understand for die-hard dog people who will spare no expense on their dogs. This year, the U.S. pet industry is estimated to be more than $60 billion. It’s no surprise, really, when dogs can get many of the same pampering treatments as humans, like an aromatherapy massage or reiki. There may be people in your office who have real concerns about sharing a space with dogs. Some people have severe allergies and don’t want to be sniffling and sneezing all day at work. They may suffer from cynophobia — the scientific term for an irrational fear of dogs. Or they may simply be cat people. It may be possible to work out a solution in some situations. Maybe the pup’s gated area stays in an area of the office with low foot traffic and easy entry, so the allergy sufferer never has to come into contact with the pup’s fur, dander, saliva or other irritants. Or you can let your colleagues get adjusted over time: maybe your dog can start out coming to the office one day a week to help the cat people quell their fears by easing into the arrangement. And if all else fails, just hold out for the next time Uber decides to deliver on-demand pooches to offices in need of some puppy time.